In 2004, after some careful thought, utilization of collective skills, and a lot of faith, the all-volunteer board of directors and staff launched L4L and provided its first lunches to 84 kids at Andrea Gonzales Elementary School in El Amatillo, Honduras. The theory centered on the idea that if nutritious lunches at school could be provided, then children who were often forced to drop-out of school to search for food would, instead, choose to attend school. The theory was correct! Within a few weeks of implementing the program, attendance grew from 84 kids to over 100 kids and absenteeism diminished to almost zero. Word of the lunch program continued to spread and more and more kids enrolled. Building on the success at Andrea Gonzales Elementary School, L4L now provides daily school lunches to more than 1,800 kids in 34 schools across Valle District of Honduras. The L4L program is made possible by the generosity of our donors and sponsors. School Sponsors are organizations or individuals who have committed to annual funding which makes possible the lunch program at their sponsored school. 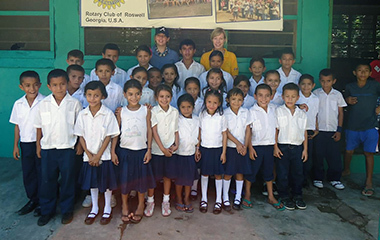 They also have the opportunity to travel with us to Honduras to visit their sponsored schools and build long-term relationships with the students, teachers, principals and families in the school community. You or your organization can sponsor one of the above-listed schools at any of the sponsorship levels indicated. As a School Sponsor, your organization will be directly associated with your selected school. Your organization or family name will be included on a permanent banner at the school. You will receive correspondence from the students several times each year and you will be encouraged to travel with us to visit your sponsored school for graduation in November. The gratitude you will receive from the students, teachers and parents is immeasurable and imminently gratifying. Visit this page to learn more about school sponsorships.